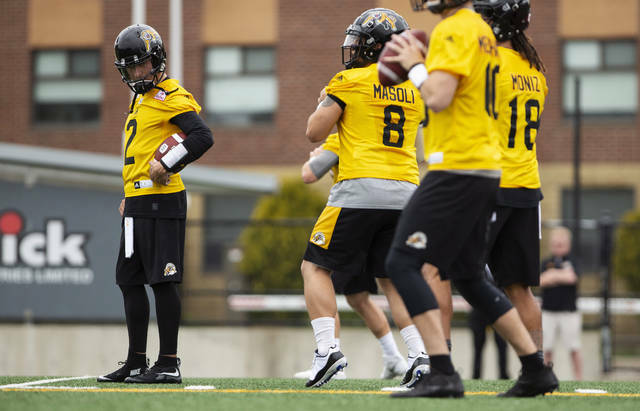 HAMILTON, Ontario (AP) — Johnny Manziel spent much of the first day of the Hamilton Tiger-Cats’ training camp as an observer. “Spacing is a little bit different on the defensive side if I had to look at anything,” Manziel said. “On offense, I’ve never ran this many routes that are predicated off of one defender … every route has an opportunity to break three or four different ways, which is different. Hamilton’s other quarterbacks include starter Jeremiah Masoli, CFL veterans Vernon Adams Jr., and Bryant Moniz along with youngsters Dane Evans and Chris Merchant of the Vanier Cup-champion Western Mustangs. 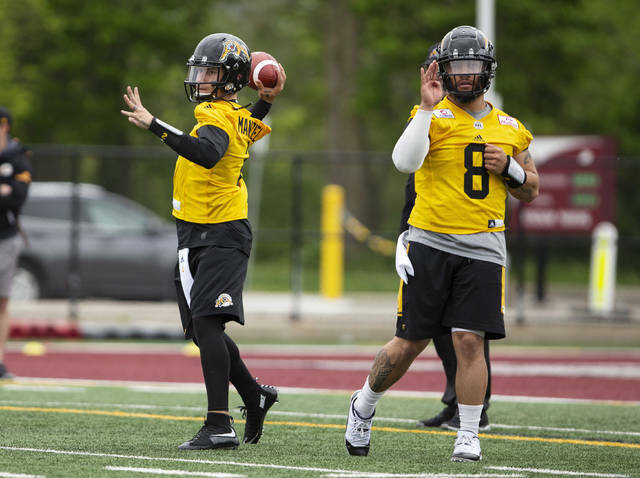 Jones said the Ticats aren’t waiting for Johnny Football to become familiar with their offensive terminology and schemes. The 25-year-old former Texas A&M star was selected in the first round — No. 22 overall — by the Cleveland Browns in the 2014 NFL draft. He was released in March 2016 after posting a 2-6 record over two tumultuous campaigns. Manziel actively pursued an NFL contract this off-season, throwing during pro days at both Texas A&M and the University of San Diego, and participating in The Spring League — a development circuit for players overlooked by the NFL. He has dealt with several off-field issues. In 2016, a domestic assault charge against Manziel in Dallas was dismissed after he took an anger management course and participated in the NFL’s substance-abuse program. In a recent interview, he said he’s been diagnosed with bipolar disorder and has stopped drinking. “I’ve been very upfront with my past and the fact that I haven’t been perfect by any means,” Manziel said. “Obviously, the magnitude of my mistakes in the past are something I’m definitely not proud of but at the end of the day I feel like I’ve come a long way from that person that I was at that time. COLUMBUS, Ohio – The first of five Ohio High School Athletic Association spring state tournaments begins Friday with boys tennis, while softball, baseball, lacrosse and track and field will enter regional tournament competition this week. Due to rain, some softball and baseball district championship games will be concluded on Monday. Home Team Listed First. Rankings are from the Fifth Ohio High School Fastpitch Softball Coaches Association State Poll released on Monday, May 14. #1 Canfield (19-9) vs. #2 Willoughby South (22-6) at Univ. of Akron, Wednesday at 2:00 p.m.
#2 Brunswick (24-5) vs. #2 Massillon Perry (21-4) at University of Akron, Wednesday at 5:00 p.m. Regional Final: at Univ. of Akron, Saturday at 12:00 p.m.
#1 Perrysburg (27-2) vs. #1 Elyria (25-4) at Clyde High School, Wednesday at 2:00 p.m.
#1 Brecksville-Broadview Heights (20-10) vs. #4 Anthony Wayne (20-4) at Clyde High School, Wednesday at 5:00 p.m. Regional Final: at Clyde High School, Saturday at 12:00 p.m.
#19 Westerville Central (17-9) vs. #10 Teays Valley at The Ohio State University, Wednesday at 2:00 p.m.
#13 Lewis Center Olentangy vs. #6 Gahanna Lincoln (18-7) at The Ohio State University, Wednesday at 5:00 p.m. Regional Final: at The Ohio State University, Saturday at 12:00 p.m.
#1 Lebanon vs. #3 Liberty Township Lakota East at Centerville High School, Wednesday at 2:00 p.m.
#2 Lakota West vs. #1 Mason or #13 Centerville at Centerville High School, Wednesday at 5:00 p.m. Regional Final: at Centerville High School, Saturday at 12:00 p.m.
#2 Perry (25-4) vs. #1 Beloit West Branch at Akron Firestone Stadium, Wednesday at 2:00 p.m.
#2 Peninsula Woodridge (14-10) vs. #5 Canal Fulton Northwest (16-4) at Akron Firestone Stadium, Wednesday at 5:00 p.m. Regional Final: at Akron Firestone Stadium, Saturday at 12:00 p.m.
#1 Oak Harbor (25-5) vs. LaGrange Keystone (31-0) at Tiffin Univ. Sports Complex, Wednesday at 2:00 p.m.
#1 Madison Comprehensive vs. #2 Defiance at Tiffin Univ. Sports Complex, Wednesday at 5:00 p.m. Regional Final: at Tiffin Univ. Sports Complex, Saturday at 12:00 p.m.
#1 Warsaw River View vs. #3 Granville at Pickerington Central, Wednesday at 2:00 p.m.
#3 Lancaster Fairfield Union vs. Waverly at Pickerington Central, Wednesday at 5:00 p.m. Regional Final: at Pickerington Central, Saturday at 12:00 p.m.
#1 Greenville vs. #1 Clarksville Clinton-Massie at Mason High School, Wednesday at 2:00 p.m.
#1 Kenton Ridge or #2 Monroe vs. #2 Plain City Jonathan Alder at Mason High School, Wednesday at 5:00 p.m. Regional Final: at Mason High School, Saturday at 12:00 p.m.
Atwater Waterloo vs. #1 Independence at Massillon Washington High School, Wednesday at 2:00 p.m.
#1 Warren Champion (26-0) vs. #2 Akron Manchester (18-7) at Massillon Washington High School, Wednesday at 5:00 p.m. Regional Final: at Massillon Washington High School, Saturday at 12:00 p.m.
#1 Pemberville Eastwood vs. #1 Fairview (17-6) Henry at Findlay High School, Wednesday at 2:00 p.m.
#2 Cardington-Lincoln vs. #4 Galion (16-6) at Findlay High School, Wednesday at 5:00 p.m. Regional Final: at Findlay High School, Saturday at 12:00 p.m.
#4 Byesville Meadowbrook vs. Fairfield at Lancaster High School, Wednesday at 3:00 p.m.
Wheelersburg or Dawson-Bryant vs. #3 Lore City Buckeye Trail (22-3) at Lancaster High School, Wednesday at 6:00 p.m. Regional Final: at Lancaster High School, Saturday at 12:00 p.m.
#1 West Liberty-Salem vs. #1 Richwood North Union (23-2) at Wright State Univ., Wednesday at 5:00 p.m.
#6 Indian Lake or #2 Deer Park vs. #1 Williamsburg at Wright State Univ., Wednesday at 2:00 p.m. Regional Final: at Wright State Univ., Saturday at 12:00 p.m.
#1 Jeromesville Hillsdale vs. #3 Bristolville Bristol (18-4) at Akron Firestone Stadium, Thursday at 2:00 p.m.
#4 Sycamore Mohawk (18-7) vs. #1 East Canton (20-5) at Akron Firestone Stadium, Thursday at 5:00 p.m. Regional Final: at Akron Firestone Stadium, Saturday at 3:00 p.m.
#3 Gibsonburg (17-5) vs #3 North Baltimore (16-5) at The Marathon Diamonds, Wednesday at 2:00 p.m.
#1 Defiance Tinora vs. #2 Ada at The Marathon Diamonds, Wednesday at 5:00 p.m. Regional Final: at The Marathon Diamonds, Saturday at 12:00 p.m.
Lucasville Valley vs. #2 Danville at Pickerington Central, Wednesday at 2:00 p.m.
Portsmouth Clay vs. #1 Strasburg-Franklin (20-5) at Pickerington Central, Wednesday at 5:00 p.m.
#1 Newton Local or #1 Fayetteville-Perry vs. #2 Rockford Parkway (20-4) at Greenville Softball Association Fields, Wednesday at 2:00 p.m.
#4 Mechanicsburg vs. #3 Bradford at Greenville Softball Association Fields, Wednesday at 5:00 p.m. Regional Final: at Greenville Softball Association Fields, Saturday at 12:00 p.m.
No. 16 Solon (17-5) vs. No. 5 Massillon Jackson (22-5) at Thurman Munson Stadium, Thurs., 2 p.m.
Medina Highland (17-9) vs. Mentor (16-6) at Thurman Munson Stadium, Thurs., 5 p.m. Regional Final: at Thurman Munson Stadium, Fri., 5 p.m.
No. 2 Powell Olentangy Liberty (26-4) vs. No. 18 Lancaster (20-9) at Dublin Coffman High School, Thurs., 2 p.m.
No. 13 Lewis Center Olentangy (21-9) vs. New Albany (19-8) at Dublin Coffman High School, Thurs., 5 p.m. Regional Final: at Dublin Coffman High School, Fri., 5 p.m.
No. 8 Whitehouse Anthony Wayne (23-4) vs. Toledo St. John’s Jesuit (18-6) at Bowling Green State University, Thurs., 5 p.m.
Strongsville (15-11) vs. No. 1 Amherst Steele (24-4) at Cuyahoga Community College West, Thurs., 5 p.m. Regional Final: at Bowling Green State University, Fri., 5 p.m.
No. 20 Cincinnati Elder vs. No. 5 Cincinnati Archbishop Moeller at University of Cincinnati, Thurs., 2 p.m. Winner of No. 7 Mason vs. Clayton Northmont vs. winner of Centerville vs. Loveland at University of Cincinnati, Thurs., 5 p.m. Regional Final: at University of Cincinnati, Fri., 5 p.m. Region 1 vs. Region 2, Fri., June 1, 10 a.m. Region 3 vs. Region 4, Fri., June 1, 1 p.m.
Div. I State Championship: Sat., June 2, 4 p.m. Winner of No. 6 Ontario vs. Bellville Clear Fork vs. Hebron Lakewood (22-6) at Bowling Green Carter Park, Thurs., 5 p.m.
No. 3 Oberlin Firelands (24-3) vs. No. 1 Wapakoneta (21-1) at Bowling Green Carter Park, Thurs., 2 p.m. Regional Final: at Bowling Green Carter Park, Fri., 5 p.m.
Steubenville (14-6) vs. No. 13 New Concord John Glenn (20-4) at Ohio University – Bob Wren Stadium & Trautwein Field, Thurs., 5 p.m.
Circleville (17-5) vs. No. 4 Chillicothe Unioto (24-5) at Ohio University – Bob Wren Stadium & Trautwein Field, Thurs., 2 p.m. Regional Final: at Ohio University – Bob Wren Stadium & Trautwein Field, Fri., 5 p.m.
Chardon (20-8) vs. Canfield (19-7) at The Ball Park at Hudson, Thurs., 2 p.m.
Richfield Revere (13-14) vs. No. 17 Tallmadge (16-11) at The Ball Park at Hudson, Thurs., 5 p.m. Regional Final: at The Ball Park at Hudson, Fri., 5 p.m.
Dayton Chaminade Julienne vs. Columbus Bishop Hartley (17-7) at Mason High School, Thurs., 5 p.m.
Cincinnati Hills Christian Academy (23-5) vs. winner of No. 2 Tipp City Tippecanoe/winner of Hamilton Ross vs. Cleves Taylor at Mason High School, Thurs., 2 p.m. Regional Final: at Mason High School, Fri., 5 p.m. Region 6 vs. Region 7, Fri., June 1, 4 p.m. Region 5 vs. Region 8, Fri., June 1, 7 p.m.
Div. II State Championship: Sat., June 2, 7 p.m.
Gahanna Columbus Academy (17-13) vs. No. 4 Archbold (23-5) at Elida Middle School – Ed Sandy Field, Thurs., 5 p.m.
No. 6 Coldwater (23-6) vs. Milan Edison (15-9) at Elida Middle School – Ed Sandy Field, Thurs., 2 p.m. Regional Final: at Elida Middle School – Ed Sandy Field, Fri., 5 p.m.
West Lafayette Ridgewood (19-10) vs. No. 16 Fredericktown (17-7) at Mount Vernon High School, Thurs., 5 p.m.
No. 12 Minford (22-2) vs. Lucasville Valley (18-11) at Chillicothe Paints Stadium, Thurs., 5 p.m. Regional Final: at The Ohio State University – Bill Davis Stadium, Fri., 5 p.m.
Middletown Madison Senior (23-4) vs. Cincinnati Madeira at Athletes in Action Sports Complex, Thurs., 2 p.m.
Bethel-Tate vs. Blanchester at Athletes in Action Sports Complex, Thurs., 5 p.m. Regional Final: at Athletes in Action Sports Complex, Fri., 5 p.m.
No. 11 Apple Creek Waynedale (20-6) vs. Canfield South Range (14-15) at Massillon Washington High School, Thurs., 2 p.m.
Orwell Grand Valley (15-7) vs. Kirtland (14-11) at Massillon Washington High School, Thurs., 5 p.m. Regional Final: at Massillon Washington High School, Fri., 5 p.m. Region 10 vs. Region 11, Thurs., May 31, 4 p.m. Region 12 vs. Region 9, Thurs., May 31, 7 p.m.
Div. III State Championship: Sat., June 2, 1 p.m.
Toledo Ottawa Hills (13-12) vs. Cuyahoga Heights (13-7) at Pipe Yard Stadium, Thurs., 3 p.m.
Garfield Heights Trinity (20-3) vs. New Middletown Springfield (19-4) at Pipe Yard Stadium, Thurs., 5:30 p.m. Regional Final: at Pipe Yard Stadium, Fri., 5 p.m.
No. 14 Minster (21-7) vs. No. 15 Fort Loramie (20-5) at Carlton Davidson Stadium., Thurs., 5 p.m.
Russia (19-8) vs. Fairfield Cincinnati Christian (15-8) at Carlton Davidson Stadium., Thurs., 2 p.m. Regional Final: at Carlton Davidson Stadium., Fri., 5 p.m.
North Baltimore (17-9) vs. Plymouth (17-10) at Patrick Henry High School, Thurs., 2 p.m.
No. 11 Lima Central Catholic (17-7) vs. No. 9 Hicksville (18-5) at Patrick Henry High School, Thurs., 5 p.m. Regional Final: at Patrick Henry High School, Fri., 5 p.m.
No. 16 Centerburg (18-8) vs. Reedsville Eastern (26-2) at Beavers Field, Thurs., 2 p.m.
No. 4 Toronto (20-4-1) vs. No. 1 Mowrystown Whiteoak (26-1) at Beavers Field, Thurs., 5 p.m. Regional Final: at Beavers Field, Fri., 5 p.m. Region 13 vs. Region 16, Thurs., May 31, 10 a.m. Region 14 vs. Region 15, Thurs., May 31, 1 p.m.
Div. IV State Championship: Sat., June 2, 10 a.m. Dates, Locations and Times Subject to Change. Records Indicated are from Available Information. Dublin Jerome (15-5) at Dublin Coffman (19-1), Tuesday at 7 p.m.
Lewis Center Olentangy (16-3) at Powell Olentangy Liberty (13-6), Tuesday at 7 p.m.
North Canton Hoover (14-5) at Cle. St. Ignatius (13-7), Tuesday at 7 p.m.
Massillon Jackson (14-6) at Hudson (12-5), Tuesday at 7 p.m.
Hilliard Davidson (12-8) at Upper Arlington (18-2), Tuesday at 7 p.m.
Loveland (14-6) at Cin. St. Xavier (15-3), Tuesday at 6:30 p.m.
Springboro (16-2) at Cin. Archbishop Moeller (14-6), Tuesday at 6 p.m.
State Final: at Selby Stadium, Ohio Wesleyan University, Saturday, June 2, at 7 p.m.
Tol. St. Francis de Sales (10-7) at Rocky River (17-3), Monday at 6 p.m.
Cuy. Valley Christian Acad. (13-4) at Tol. Ottawa Hills (17-1), Monday at 6 p.m.
Akr. Archbishop Hoban (17-3) at Chagrin Falls (14-1), Monday at 7 p.m. Chagrin Falls Kenston (16-3) at Hunting Valley Univ. School (11-5), Monday at 5 p.m.
Kettering Archbishop Alter (12-2) at Cols. St. Francis De Sales (15-3), Monday at 6 p.m.
Cols. Bishop Watterson (10-6) at Delaware Buckeye Valley (15-2), Tuesday at 6 p.m.
Cin. Summit Country Day (9-8) at Cin. Mariemont (16-2), Monday at 7 p.m.
Cin. Seven Hills (9-8) at Cin. Indian Hill (12-6), Monday at 7 p.m.
State Final: at Selby Stadium, Ohio Wesleyan University, Saturday, June 2, at 1 p.m.
Strongsville (13-5) at New Albany (18-1), Monday at 6 p.m.
Lewis Center Olentangy (14-6) at Powell Olentangy Liberty (15-2), Monday at 7 p.m.
Green (11-8) at Massillon Jackson (14-3), Monday at 6 p.m.
Cle. Hts. (8-10-1) at Hudson (12-2), Monday at 5:30 p.m.
Springboro (17-3) at Upper Arlington (17-0), Monday at 6 p.m.
Dublin Jerome (13-4) at Thomas Worthington (15-4-1), Monday at 7:30 p.m.
Mason (12-8) at Cin. Mt. Notre Dame (19-1), Monday at 4:45 p.m.
Cin. Sycamore (7-11) at Loveland (16-3), Monday at 6 p.m.
State Final: at Selby Stadium, Ohio Wesleyan University, Saturday, June 2, at 4 p.m.
Tol. St. Ursula Acad. (14-2) at Rocky River (16-3), Tuesday at 6 p.m.
Tol. Notre Dame Acad. (13-6) at Richfield Revere (15-3), Tuesday at 6 p.m.
Shaker Hts. Laurel (12-3) at Chagrin Falls (10-7), Tuesday at 6:15 p.m.
Gates Mills Hawken (7-11) at Shaker Hts. Hathaway Brown (11-6), Tuesday at 5 p.m.
Granville (11-5) at Cols. St. Francis De Sales (16-3), Tuesday at 5 p.m.
Worthington Kilbourne (13-7) at Gahanna Cols. Academy (13-3), Tuesday at 6 p.m.
Cin. Turpin (11-6-1) at Cin. Mariemont (13-4), Tuesday at 7 p.m.
Cin. Summit Country Day (9-8) at Cin. Indian Hill (14-4), Tuesday at 6 p.m.
State Final: at Selby Stadium, Ohio Wesleyan University, Saturday, June 2, at 10 a.m.
COLUMBUS, Ohio – Ohio High School Athletic Association member schools have passed all eight proposed revisions to the OHSAA Bylaws, Executive Director Daniel B. Ross, Ph.D., announced Wednesday. The ballot counting procedure was conducted at the OHSAA office Wednesday following the deadline for schools to submit ballots Tuesday at 4 p.m. The approved changes will go into effect August 1 unless otherwise noted. A simple majority approval by member schools required for a proposed amendment to be adopted. Among the approved referendum items is a change to the consequence for students who do not meet one of the transfer bylaw exceptions (see 4 B below). Previously, a student would sit out the first half of the season of the sports that the student played in the last 12 months. The change passed by the membership, effective immediately, will cause the student to sit out the second half of the season and the OHSAA postseason tournament. The OHSAA’s annual referendum voting and District Athletic Board election period is from May 1-15. Each member school has one vote, which is cast by the principal. After 809 ballots were mailed to member high schools in late April, 697 valid ballots were returned for a voter turnout of 86 percent. Amend to provide clarity when school districts consolidate and when schools open, close or merge in either public multiple high school districts or non-public systems in terms of counting students for classification purposes. Amend to make it clear that there is no eligibility unless a student has a parent, biological or adoptive, who lives in Ohio or meets an exception. A student whose parent(s) has been continuously employed for a minimum of three years as a fulltime, licensed or classified employee in an Ohio school district or system, may be declared eligible in an Ohio school in that district or system where the parent is employed. Once eligibility is established at the member school/district, the student shall remain eligible under this exception for as long as he or she maintains continuous enrollment in that school. Permit the Executive Director’s Office to consider waiving the scholarship and semester requirements for a domestic student studying outside the United States and restoring eligibility upon return to the same high school under the three stipulated conditions: application in advance of the program; no sports participation during the experience; and available only after completing the first or second year of high school. Member schools containing grades 7 and 8 may combine students from two or more schools within the school district/system to form one or more interscholastic teams in a sport. Requests for permission to combine students from two or more schools in the same public district or non-public system must be submitted annually to the OHSAA in writing by the superintendent of the public district or non-public system.